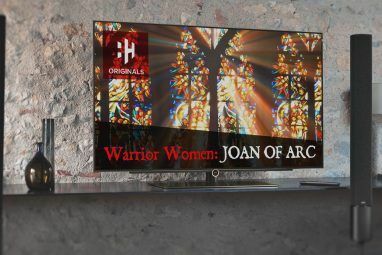 There are so many different ways to connect video sources to TVs and monitors these days — and it can get confusing, especially because so many of these ports and connectors have become obsolete over the years. This means that there are a lot of devices out there in the world with many different types of video connections. But what are the differences between them all? Which ones do you need to care about? What’s the bottom line? In this article, we’ll explore the most prominent cable types of today and when you may want to use each one. The Video Graphics Array (VGA) is one of the oldest connection standards which can still be found in large swaths of computing equipment. It was first developed by IBM and introduced in 1987. It was widely used for video cards, TV sets, computer monitors, and laptops 3 Easy Steps to a Dual Monitor Setup and an Extended Desktop 3 Easy Steps to a Dual Monitor Setup and an Extended Desktop A dual monitor setup is wonderful. But does your PC support multiple monitors? We'll show you how to use two monitors or more. Read More . VGA can support resolutions up to 640 x 480 in 16 colors, although you can increase the colors to 256 by lowering the resolution to 320 x 200. This is known as Mode 13h and is commonly used when booting your computer into Safe Mode. It’s also the mode that was used in computer gaming back in the late 1980s and early 1990s. The VGA cable can carry RGBHV video signals: Red, Green, Blue, Horizontal Sync, and Vertical Sync. The VGA socket is made up of 15 pins in three rows of five pins, and typically colored blue. The cable socket is securely attached to the device using two screws, one on each side of the socket. 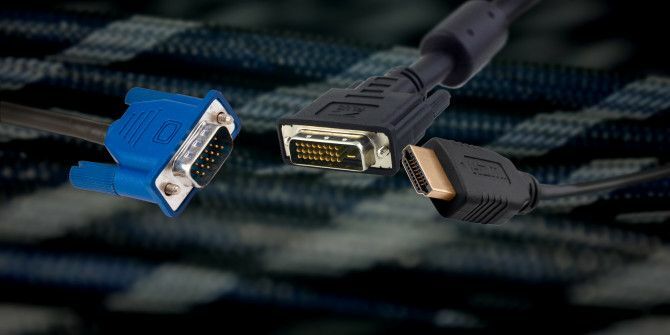 It is rarely used today and is mostly found on older hardware, having been largely replaced by the digital DVI and HDMI connections, which we explore later in this article. The famous red, white, and yellow setup of the RCA connector was once the most popular and widespread connection type for audio/visual devices. While they are often referred to as RCA cables, RCA actually refers to the metal connectors at the end of the cables, named after the Radio Corporation of America which popularized the connection type. The cables themselves are red and white audio cables and yellow for single channel composite video. The three cables together are able to transmit stereo audio along with video up to 480i or 576i resolution — where the i refers to interlaced video Graphic Display Resolutions - What Do The Numbers Mean? [MakeUseOf Explains] Graphic Display Resolutions - What Do The Numbers Mean? [MakeUseOf Explains] Display resolutions can be a rather cryptic business, with multiple standards used to describe the same display resolution in 10 different ways. All of those technical terms tend to change based on the display's purpose... Read More . Just as with VGA, the once-popular RCA connector has been superseded by the digital DVI and HDMI connections. DVI-I (Integrated) combines digital and analog in the same connector. DVI-D (Digital) supports digital signals only. DVI-A (Analog) supports analog only. DVI-I and DVI-D can come in single- or dual-link varieties. Single-link can support 1920 x 1200 at 60 Hz, while adding a second digital transmitter for dual-link means the resolution can be increased to 2560 x 1600 at 60 Hz. In order to prevent forced obsolescence of VGA devices, DVI was developed to support analog connections using the DVI-A mode. This meant that DVI connections and devices could be backwards-compatible with VGA connections. Apple is infamous for always trying to make their devices thinner and lighter. Most people think of this as a relatively recent development, but they’ve been at it since at least 2006 when they decided to move on from the mini-VGA port. In its place, they developed the mini-DVI connector. It was included in the PowerBook G4, Intel-based iMacs and Macbooks, and Xserve. The mini-DVI doesn’t support dual-link connections and so was always limited to resolutions of 1920 x 1200 or less. This, in conjunction with advancing technology, led Apple to discontinue the use of mini-DVI in 2008 and replace it with Mini DisplayPort connections instead. HDMI, or High Definition Media Input, is a proprietary but wildly successful digital audio and video transfer interface. HDMI was created by a group of electronics manufacturers — including Sony, Sanyo, and Toshiba — to transfer video (uncompressed) and audio (either uncompressed or eight-channel compressed) to computer monitors, digital TVs, and DVD or Blu-ray players. As of HDMI 1.4, it can support 24-bit uncompressed audio at 192 kHz and video resolutions up to 4096 x 2160, which is also known as 4K or Ultra HD What's the Difference Between 4K and Ultra HD? What's the Difference Between 4K and Ultra HD? Thinking of buying a new TV or monitor but feeling lost with all of the terminology like 4K and Ultra HD? Here's everything you need to know about it. Read More . As HDMI uses the same video format standards as DVI, the two are compatible through an adapter. As no signal conversion is necessary, there is no loss of quality either (although unlike HDMI, DVI does not support audio). There are three commonly used HDMI connectors. Type A is the full-sized HDMI connection for use on TVs and home theater equipment. Mini-HDMI (Type C) is commonly used on laptops and tablets, while Micro-HDMI (Type D) is mostly used on mobile devices. DisplayPort is a digital display interface developed by the Video Electronics Standards Association (VESA). DisplayPort can carry digital video and audio, making it functionally similar to HDMI. As of DisplayPort 1.4, there is support for resolutions up to 8K (7680 x 4320) at 60 Hz, which surpasses even HDMI 1.4. However, HDMI and DisplayPort were designed for different markets. While HDMI was made primarily for home entertainment, DisplayPort was designed for connecting computing devices to monitors. Due to their similar functionality, it is possible to connect DisplayPort and HDMI devices together using a Dual-Mode DisplayPort adapter. DisplayPort operates using packet data transmission which is commonly used in Ethernet and USB connections, and that’s what makes it ideal for use in computing as opposed to home entertainment. Apple replaced the mini-DVI connection on their Macbooks and iMacs with their own take on DisplayPort, known as Mini DisplayPort (MDP). Although Apple created MDP, it was incorporated into VESA’s DisplayPort 1.2 specification in 2009. Thunderbolt is an interface used to connect peripheral devices to a computer. It was originally developed by Intel under the name of Light Peak and used optical cables for data transfer (hence the name Light Peak). After extensive testing, Intel found they could make it cheaper with copper cables without impacting performance. Apple was the first manufacturer to bring Thunderbolt to the market in their MacBook Pro models in 2011. When Thunderbolt debuted, it was able to use the MDP connector that Apple had created, meaning the new connection would be backwards-compatible. One of the biggest advantages of Thunderbolt over DisplayPort is the high speed of data transfer. Versions 1 and 2 of Thunderbolt could transfer at a rate of 20 GB/s using the MDP connector. Thunderbolt 3 will increase this Thunderbolt 3: What It Is & Why You Need to Start Using It Thunderbolt 3: What It Is & Why You Need to Start Using It Thunderbolt 3 may just be the only device cable you need to know about anymore. It's so awesome that it's making everything else obsolete. Here's what you need to know. Read More to 40 GB/s by using the USB Type-C connector in place of the MDP. Using one Thunderbolt port, it is possible to connect up to six peripherals Use a Thunderbolt Daisychain to Connect Your Mac Accessories Like a Boss Use a Thunderbolt Daisychain to Connect Your Mac Accessories Like a Boss Not many people know what daisy chaining is, why it's useful, or why Thunderbolt is so important for it. Read More through a technique called daisy-chaining, which reduces the amount of ports needed on a device. Thunderbolt is able to carry audio either using the DisplayPort protocol or by using USB audio cards. As of Thunderbolt 2, there was support for DisplayPort 1.2 specifications, which allowed for 4K streaming to a 4K monitor. If you’re still confused, the good news is that the world is moving towards a unified standard. HDMI Licensing recently announced that in order to connect to an HDMI device, all you will need is a compatible USB Type-C to HDMI cable Everything You Need to Know About HDMI Alt Mode and USB Type-C Everything You Need to Know About HDMI Alt Mode and USB Type-C The new HDMI Alt Mode standard will allow phones and tablets to stream directly to monitors and TVs using USB-C-to-HDMI cables. Here's all you need to know about it. Read More which can run in “Alt Mode”. This is one part of the industry’s larger push to simplify cabling. Standardization is possible — remember all of the proprietary mobile device chargers that existed before the micro-USB standard? It’s like that, except this time the industry is pushing USB Type-C as the next all-in-one standard for audio, video, power, and all other connections. Apple is so certain of this future that at their 2016 Fall event they launched a Macbook Pro Apple Unveils New Touchy-Feely MacBook Pro Apple Unveils New Touchy-Feely MacBook Pro Apple has taken the wraps off of its brand new MacBook Pro. It's a beautifully designed piece of hardware, with several innovative touches and some annoying caveats potential buyers will have to beware. Read More which exclusively uses USB Type-C ports for all connections and power. 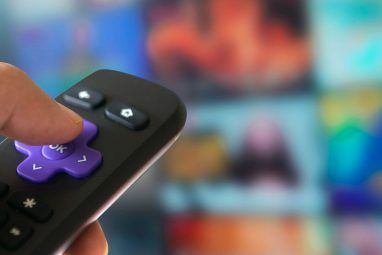 While this might take a while to become the standard connection, the future is starting to take shape where you may not need a hundred different cables just to watch video content. What do you think: will USB Type-C replace your video cables? Which is your preferred connection? Which do you have in your collection? Let us know in the comments below! Explore more about: Computer Monitor, HDMI, Media Streaming, . I have a 2010 MacBook Pro which appears to have a MiniPort by Apple which is mentioned in this great article. My TV is an Insignia smart tv within the last 10 yrs. I would love to know how to number 1 cast from my Mac to my tv. There always shows a cast icon but doesn't work however casting ( same wifi) from my iPhone works fine. Secondly I'd love to know how to send and use whatever i'm doing on my mac to my tv? As I mentioned i think i have the mini port HDMI on my mac and it appears my tv has all the bells and whistles. Also in Mission Control on my Mac I have an icon that says Audio MIDI setup ( ? ) maybe that's something to use because my Mac is so old and I read even with the mini port it won't transmit audio. One problem I notice is that, the smaller the connector gets, the less rigidity you get at the connector. I'm all for small and I love the "C" connector but the cable connection on those cables is so easy to accidentally disconnect. There needs to be some kind of a locking mechanism to hold the cable safely in place. This is a great article, very informative. Thanks! No problem - glad to have helped! Can you identify a DVI looking connecter (on the back of a PC) with 3 rows of 10 = 30 pins? No identifying information on the video card, sticker on the video board says "MIC G012-01-3461", text print on chip "Silicon Image" . Compaq EVO D500 CMT 845 BU ALL. I have a monitor and tried using a hdmi cable to connect to laptop. I wanted to view what I see on laptop on monitor. The monitor is bigger and better screen quality. Why doesn't the hdmi cable work? I am going to buy a VGA cable and see if that'll work. Hi, I've only just seen this article via a link. You may have already fixed it . Your monitor menu may have an "INPUT" or "SOURCE" option, find this option in the menu and select HDMI. Hope this helps. Hi there... I would like to know what is the two round adapters for in the SVGA cable. hello guyz can i use HDMI TO HDMI both to my MONITOR TO CPU..my Videocard has a HDMI port and DVI, VGA.my monitor has a HDMI AND VGA port.however my main question is that can i use HDMI TO HDMI TO MY MONITOR TO MY CPU in my videocard? In 2007 ,to be the exclusive Sales and Marketing representatives for North America and Europe. We set up sales offices & design house in both the Hong Kong and San Diego. TWe offer a wide product range that includes USB3.1 TYPE C, HDMI Cables, DVI Cables, Computer Cables, USB Cables, 1394 Cables, Fiber Optic Cables along with a variety of accessory products. Founded under the principles of “Best Quality, Best Service”, we have taken great strides to ensure that all of our products are manufactured under strict QA/QC Procedures that are documented during all aspects of the manufacturing process. These written quality control procedures are followed from the raw material stage to the final packaging of the product. Our products are exported to countries around the world following all of the safety, testing and protocols each country requires. ASL offers factory-direct pricing and quality-tested products that will meet and exceed your expectations. We look forward to having the opportunity to demonstrate our strengths to you! My laptop has only HDMI port and the projector has VGA port. what solution can you suggest? i have a hdmi to vga cable. do i need a converter for it to work? I have a old Samsung Plasma TV that does not have any HDMI port. It does have a DVI-D port though. With every streaming device now having only a HDMI port, I intend using a HDMI-to-DVI-D-converter to connect my ROKU box with this Plasma TV. Would I still get the audio out of my ROKU using HDMI-DVI converter into the TV? HDMI is compatible with VGA as well yes? I just want to confirm so I know what I'm doing when I go buy adapters/converters because I want to connect an external monitor to my laptop. So it seems like an HDMI & DVI-D converter works! Would HDMI/DVID or HDMI/VGA work better? THANK YOU SO MUCH. I am new to the AV industry and I got more out of this article than any where else! Thank you, always wondered about the DVI having different pins sometimes. I am searching for about this and now thank for your post. It is precious for me. Purchased my Dell at the end of 2007 and I only have VGA. I only have a VGA port on my laptop. Didn't know much about these different ports when I bought laptop. Really interesting. Whay about the Display Port? I've seen this kind of port in many today's boards. display port is better than HDMI..
Nice and useful article. I just have one question, why not include DisplayPort? I love this idea of educating the masses on these simple things. Us geeks have known for years, and it doesn't take much to look up the differences. However, it is important for Joe Consumer to understand, as the manufacturers *sure don't* explain the differences when buying - especially low-end - monitors and such. It *is* too bad you didn't add DisplayPort though, as *that* may be the future of how we dock our mobile devices to multi-monitor setups with keyboard and mouse all with one cable. Let me add one more thing: Avoid Analog at all costs. You want Digital. Digital Digital Digital. No DVI-A (or analog over DVI-I). .. and, again, DisplayPort - watch for it! Want to future proof your next monitor purchase? Buy one with a DisplayPort (DP) input. When you mentioned the DisplayPort, is this the same port that is referred to as a "Mini DisplayPort" on my MacBook Pro? Nice article which helps clear up the mystery about the different connections for video. I find this to be especially helpful in covering the differences between the various DVI connecters which can be confusing. One thing to remember is that you don't need to spend horrendous amounts of money on the digital cables as the inexpensive ones will carry the digital signal as well as the expensive ones. No there is no difference. I have a $60 Monster Cable and there is no difference in the signal whatsoever between that and a $15 one. As far as adapters go, I have seen different qualities between adapters. The most important thing with adapters it that all connections are as secure as possible, and try to avoid having any hanging stress on the cables or connections. HDMI is the future now, rarely we can get modern labtop with out HDMI , and it is used in all LED,LCD TV. You even have HDMI with network support, although I have no clue what it means, or can do. My "old" Geforce from 2008) features twin DVI but my monitor has only analog input, thus using an adapter, coupled with humidity killed the card 2 days ago. Looking for a new GPU now. Maybe I'll be going for a Radeon that has almost all connections DVI + HDMI and maybe a composite! only VGA, and my PC is roughly 5 yo. Whoa, I always wondered what those were all about. Thanks! My Lenovo laptop sports VGA and HDMI connections, but no DVI. Um. That's not really what "interlaced" means. You're right, and what a stupid typo it was! Thanks for pointing that out. It should be fixed soon. Someone had to do it eventually. Nice article indeed. What you recommend connect my computer to projector (DVI or VGA). It has both. I plan to connect my desk top to watch movie and surf the net with it. My compter does has HDMI but projector is not. Thanks in advance. If you can, I'd suggest using DVI. My monitor has DVI and VGA port and VGA port is used to display the monitor. i use vga :P,,cozz its on cheaper side!!! My Computer having VGA type of video connectors ..! very helpful article, since lots of people have different understanding about those type of cables. My laptop (ASUS X52F) has a VGA and an HDMI, but no DVI. They've covered most of their bases with it. HDMI is electrically compatible with DVI, so you can buy very small, very cheap convertors for it. In trending technology, HDMI is playing a vital role, where the picture quality comes in HD. Nice article with a perfect highlights. I'm a big believer in HDMI myself. Like VGA for analog video, it's perhaps the closest we've come to a universal digital video standard. Also worth noting is HDMI is compatible with DVI (minus the audio). You can pick up a $1 adapter on Amazon to convert DVI to HDMI (or vice-versa). There are also devices that allow you to hookup DVI and audio out to a HDMI connection. Newer video cards support audio out over HDMI so you can hook your computer up to the TV and hear sound by only plugging in an HDMI cable to your video card. You're right, HDMI type A and C are electrically compatible with DVI-D. You need to be careful with what type of DVI, though. Below is a small overview. Feel free to correct me if I made a mistake. My arrows disappeared. Let's try that again, shall we?